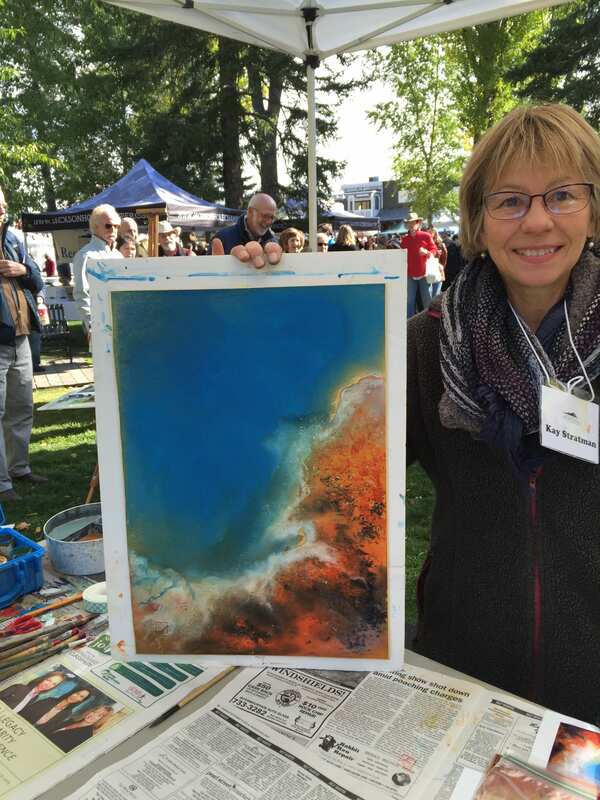 OCTOBER 15, 2015 September is always a busy month for artists and art lovers in Jackson Hole. 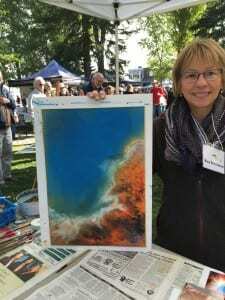 I participated in the annual Quick Draw on the town square – 30 artists create a piece from start to finish in 90 minutes, (it was 39 degrees at the start), surrounded by hundreds of onlookers, and the works are auctioned off immediately afterwards under a block-long tent with a rowdy art buying crowd in attendance and lively auctioneers. Painting in front of hundreds doesn’t bother me, but introducing myself and my painting with a microphone on stage scares the bejeezus out of me. I stayed cool, and my painting was sold with lots of bidders vying. 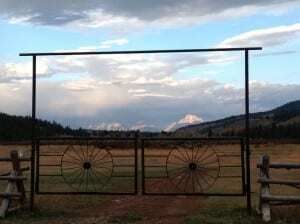 At the end of September I held my annual Splash and Pour Weekend Workshop at the gorgeous Turpin Meadow Ranch in the north east corner of Jackson Hole. It was quintessential autumn splendor – the colors were at their peak and were inspiring to all of us participating. From Portland OR to Cambridge, MA all coasts were represented. 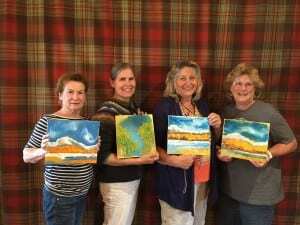 From “never held a brush”, to professional watercolorist, we all had a blast – including me. The exchange of conversation, information, questions, explorations, and “aha” moments were so delightful. 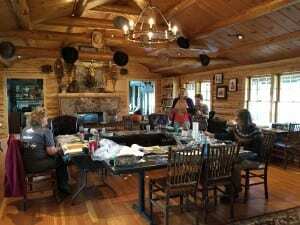 A wonderful bonus were the amenities at the Ranch. We never missed a meal because all were 5 star delicious. Hats off to all staff for making us feel most comfortable. I learned last week that my painting, “Raven’s Spring” which had been accepted into the 52nd annual national juried Sumi-e Society of America (SSA) exhibit (hanging for the month of October in Mobile AL) received an award. I am honored and humbled – my thanks to Shozo Sato, the juror and judge, for bestowing the award, and the Blue Heron chapter of the SSA for sponsoring that particular award. Some of you have followed my evolution from traditional sumi-e to something more personal. Some may think I have “drifted away”, but what has happened is that I have absorbed information from so many varied artists through workshops around the country and my own experimentations, and stirred it all up in my own stewpot to create my own “thumbprint” or style. It doesn’t resemble sumi-e much anymore – no black ink, no individual brushstrokes, no rice paper, but I cannot and will not abandon the essence of asian art that I have absorbed over the years. I don’t brand it as “Asian” in style, but people get a puzzled (or dreamy?) look on their face and declare that it has some “sort of Asian flavor”. For that I am glad. 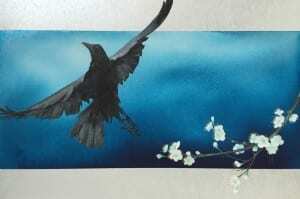 This leads me back to my painting “Raven’s Spring”: Understandably the eligibility rules for the SSA exhibit require the predominant element to be ink and brushwork on a base such as rice paper and including the shikishi boards that I now use exclusively. The raven IS painted with sumi (Japanese word for Ink), which a friend acquired for me in Japan. It has blue iridescence suspended in the ink, which allowed the feathers to shine with the natural iridescence so many bird feathers have. Though I seldom use ink any longer, I pulled it out to deliberately paint a piece that I hoped would be accepted into this show.